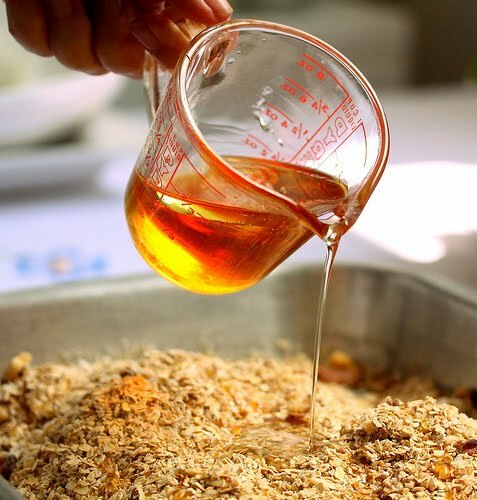 In Part 1 of the Granola School of Blogging, I took a brief trip down memory lane as I recalled finally making it into my college food co-op junior year, being "chosen" granola cook, and then being thoroughly traumatized by my first granola cooking experience, wherein I had about 70 ungreased pans full of stuck granola. Yes, I forgot to grease the pans! This, after doing everything else so right. I recounted the tears and late nights I put in to rectify the problem, and not be ridiculed by my fellow co-opers. OK, so that was then, and this is now. But we are, as they say, the sum of our parts, and as you can tell, the granola experience left an indelible impression upon me. So here I am a few years later, putting it all to good use as I concoct the "granola" school of blogging, which, upon careful reflection, I have decided....totally works, for writing effective and yes, "sticky," blog posts. Blog posts can get a little dull when you do the same thing all the time. Mix together a lot of cool tools, like video, photos, infographics, and tutorials, so you can vary the way you express your content. Vary what you write about so you can add an element of surprise for your readers. Highlight an event you attended if you haven't done that in a while, or review a film, movie, or a product that relates to your industry. Interview an expert in your field, or share with your readers a new discovery. Add some crunch to your content! Your granola has your own unique twist and flavor. The same should be true of your blog posts. Your readers should know it's you right away, and recognize your voice. It's also OK to be a little goofy or nutty once in a while, particularly if you are funny. 5. Grease Thy Pans... Market! Like a mound of granola stuck to the pan and doing no one any good whatsoever, your blog post will just sit there unless you actively market it. Try article marketing on sites like e-zines, and also post your blog links to Twitter and Facebook, and your chosen groups on Linked In. And don't forget about guest posting. You don't want to go to all the trouble of writing one great post, only to run out of steam for the next post. Try taking one day or afternoon and writing enough posts for the next week or two, and advance scheduling them. That way, you won't be scrambling for your next post, and you'll always be working ahead. That gives your readers plenty to dip into and nosh on. Don't worry about taking up too much space or running too long. Just keep things visual and moving, and your readers will stay with you. When you've found success, and a taste that folks enjoy commenting on, sharing, and linking to, share the love by telling then how you did it. What is your recipe for success? A special platform or plug-in? A new tool or trick? A unique way of beginning and ending your posts? They'll appreciate your expertise, and come back for more, by subscribing, recommending, and sharing your links on social media. And now, it's off to make the granola....I mean, go to bed. Feel free to add to this list if I forgot anything. Oh, and if you have a good granola recipe, I'll take it. Just remind me to grease the pan.